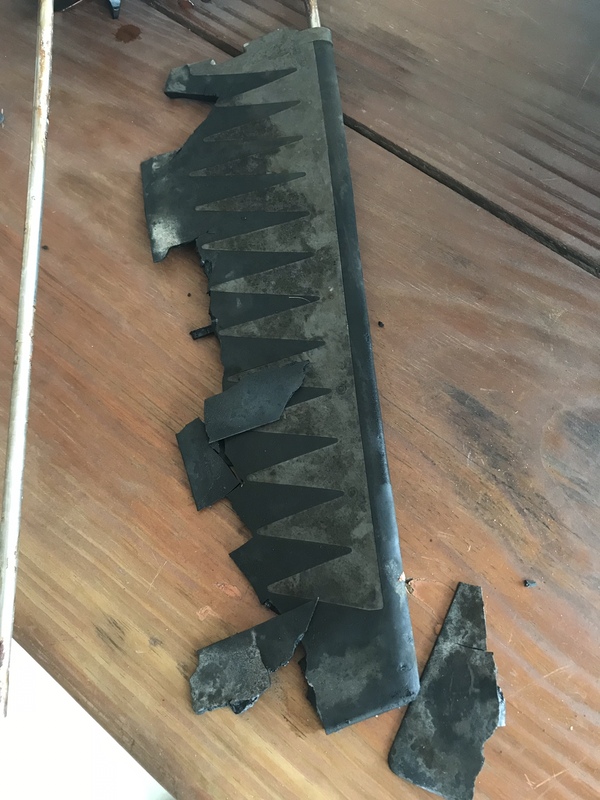 Hobie Forums • View topic - What caused my fins to become brittle? What caused my fins to become brittle? Post subject: What caused my fins to become brittle? Splashed the Outback for a quick run and almost immediately lost propulsion. Pulled up the drive and found this mangled mess. Did I put something on the fins that made them brittle? They are rinsed and stored inside of a garage after every use. The drive on the right is actually older than the mangled one. They are stored side by side. Any ideas? Post subject: Re: What caused my fins to become brittle? Heat might do it. Otherwise I note that the top of the mast spine is awfully discolored. Something just looks out of sorts on the unit where the fins broke up. I've got drives dating back to 2005 and the fins are still like new. Attacked by some chemical that dried out the rubber??? Even the gray part is discolored but has not failed yet. So weird! Petrol or acetone products maybe? I really have no idea. They literally hang side by side in the garage. One got the “disease” and the other one didn’t. I don’t spray them with anything but water after use. I guess it will always be a mystery. mold? ozone from an electrical motor? factory may have accidentally left out an ingredient in that plastic batch, or a dead cat fell in the vat? Didn't use the drive slot as a pee hole did you? If that was the cause, then my drive would look like a pair of swizzle sticks. 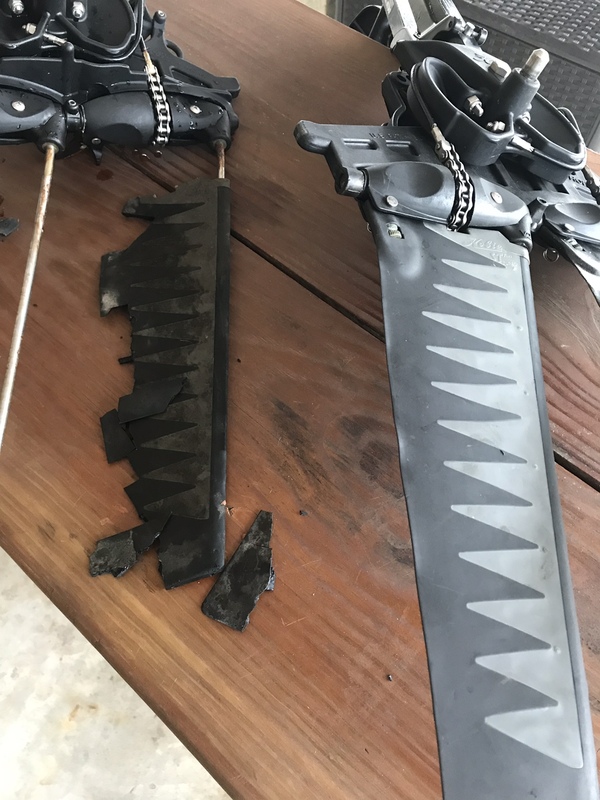 As a plastics expert, I wouldn’t sweat too much about figuring out the cause, just buy a new set of fins and be on your way, it was a fluke. Plastics like santoprene are an extremely complex blend of different plastics and rubbers along with large quantities of mineral oil, (to make it pliable). If anything goes wrong with the blending, or the processing, ( the actual molding process), that is the result, (junk). Chances are the molding machine operator decided to take a crap or lunch break just before molding your fins. Causing the hot molded plastic to sit in the barrel/ screw of the molding machine a little too long, destroying the plastic chemistry. No way to know it’s bad just looking at it when new. The bad part got past QC, your one in a million, happens very seldom. The mirage fins are consumable items anyway, they wear out and need to be replaced every couple years. I doubt you will ever experience anything like this again in your lifetime, just move on. I definately would lose any sleep trying to figure it out, ( no need, you now know exactly what went wrong). Do you store pool supplies in the garage? I had to take all the chlorine products out of my shed because everything rubber was getting attacked. Didn't take long to destroy all the straps on my goggles. … so I figured it was attacking other things too.